My sweet child and I were at a stoplight tonight next to a restaurant that is going out of business. And, that’s how it goes sometimes. I heard her explaining Chitty Chitty Bang Bang to our four-year-old neighbor. Everything is just as it sounds. It must be incredible to be six years old. I don’t remember much about it, honestly. My parents had just divorced. I think all I cared about was Grizzly Adams, MASH, and Andy Gibb. I have to remind myself to just let her be. I was very good at it when she was a baby. But after a while I realized I needed to be a little bit more strict or she would, one day, walk all over me. I wish I had a picture of the moment she realized I had changed my parenting skills. You could see from the look on her face that shet was about to get real. She was wide-eyed and her jaw dropped. It was as if her mother had disappeared and had been replaced with a crazy lady. Luckily, we’ve figured it out. She tells me every day how much she loves me, and that I am the best mommy ever. I tell her how lucky I am, and that she is the best kid ever. Tonight, I rewarded her with roasted asparagus. I cook it for 35 minutes at 375 degrees. 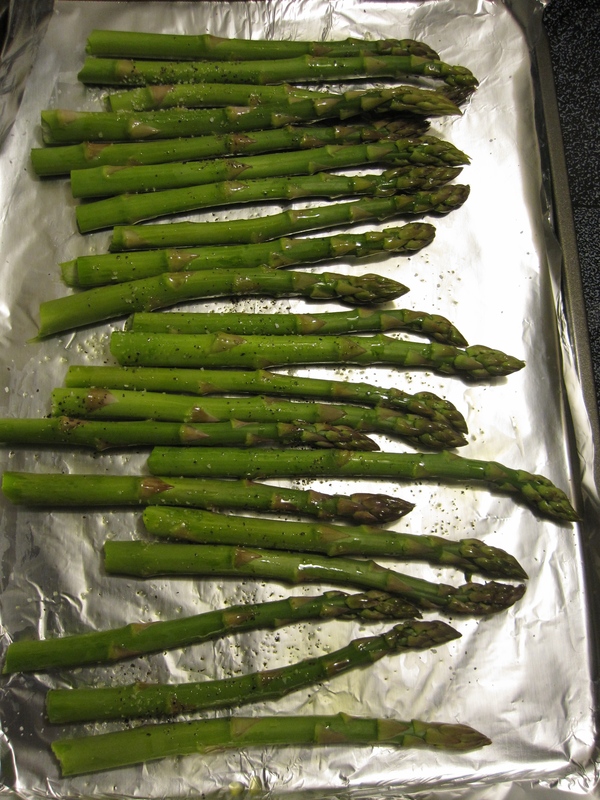 I drizzle olive oil on the asparagus, after breaking off the ends, and sprinkle with kosher salt and black pepper. I love that if there is a vegetable tray within a mile, my daughter will stand in front of it and eat all the raw broccoli and cauliflower. She loves Brussels sprouts. And asparagus; one of her favorites. So, I cooked rice and chicken and cut the asparagus into bite size pieces while she made her Valentines for her class party on Friday. The Ziploc bags have red and pink kisses all over them. So the boys get plain. And one day…they won’t.